Holidays are for celebrating, not stressing out. Granted, some stress is unavoidable during this busy time, but financial stress can always be minimized. 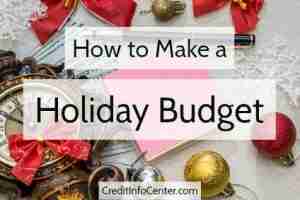 It’s never too early or too late to get yourself a holiday budget (an especially critical tool during the credit repair process). Here’s how to get yourself on track. 1) Figure out the total amount you can spend. After covering all of your regular expenses, how much do you have in your regular budget to save for holiday spending? If you start doing this in January, setting aside just a little every month should mean a healthy holiday budget come fall. But if you start doing this right before the holidays, you’ll either have to lower your expectations or set aside a bigger chunk of your income at a time. 2) Divide your holiday spending into categories. 3) Play around with the numbers. Not what you have to spend — that’s your constant (which, by the way, means what you can afford to pay with cash, not charge with credit cards racking up balances that you carry into the New Year). But you can always move things around. Deduct $10 from every gift to put toward a holiday dinner? Check out 50 cheap (and thoughtful) Christmas gift ideas. Drive your family to holiday a gathering for less than it will cost all of you to fly? Volunteer your time to make up for giving less to your favorite non-profits? Plus, there are other options for lowering your total spending entirely. Making dinner for everyone like you always do, suggest a potluck where everyone brings a dish. Buying gifts for everyone like you always do, suggest drawing names for a gift exchange. Traveling for a family get-together like you always do, stay home and host a small gathering of friends (and any family) who will be in town. 4) Let go of expectations. No matter how you spend the holidays — or what you spend on holiday expenses — it really is the thought that counts. So stop expecting everything to be “perfect” or needing to do the same thing every year. The only thing to expect of yourself during the holidays is showing people you care.